Barbara Hill and Ancelmo Lopes were drawn to UMBC by the university’s commitment to providing holistic support for students from all backgrounds. 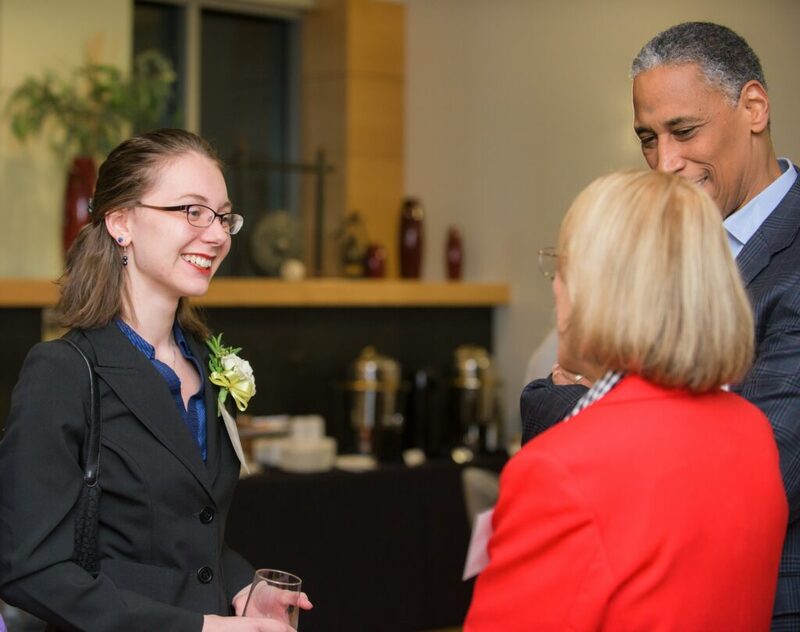 On January 13, 2017, UMBC celebrated the launch of the new Hill-Lopes Scholars Program to support high-potential women in specific STEM majors where women remain underrepresented, with a reception for the first cohort of students, their families, and their faculty mentors. 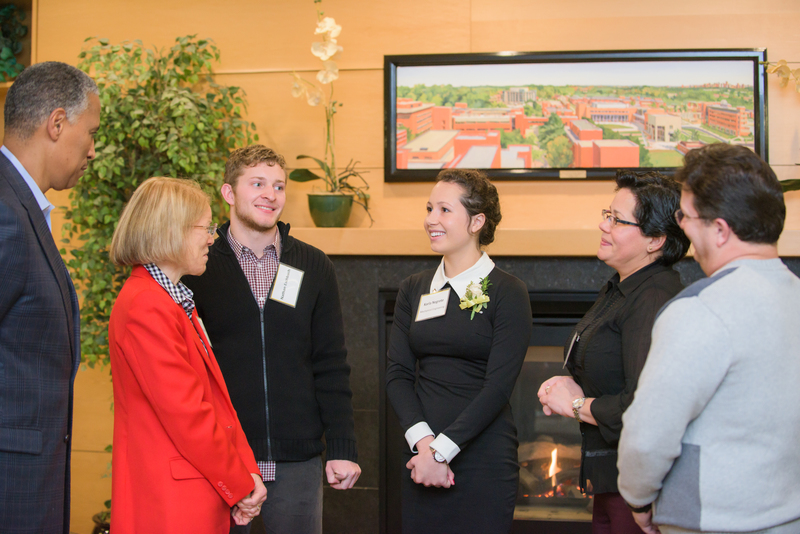 Karla Negrete ’19 (center) and her family meet Barbara Hill and Ancelmo Lopes (left). 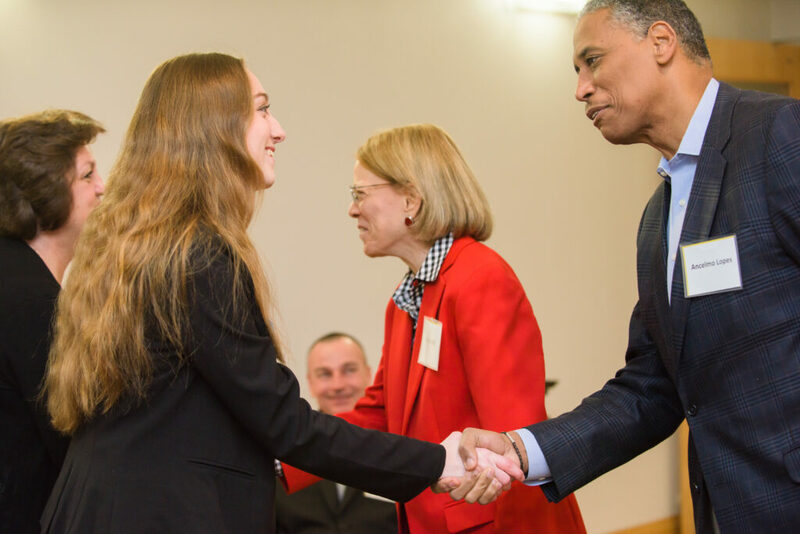 The new scholars program, made possible through a generous gift from Hill and Lopes, draws inspiration from the Meyerhoff Scholars Program, nationally-lauded as the “gold-standard” for supporting underrepresented minority students in STEM. To support students’ persistence and success, the Hill-Lopes Scholars Program provides financial assistance and connects participating scholars with faculty mentors and campus services that can propel them toward their degrees. Barbara Hill addresses the new Hill-Lopes Scholars, sharing personal stories to encourage them to persevere in the face of challenges. The six UMBC students selected as the first class of Hill-Lopes Scholars have a broad range of intellectual interests, but all have their eye on advanced degrees and careers in highly competitive STEM fields. Heather Frank ’17, biochemistry and molecular biology, conducts research in the lab of University Distinguished Professor Michael Summers and just published a first-author paper in the prestigious journal Proceedings of the National Academy of Sciences. Karla Negrete ’19, mechanical engineering, began her work in research as a high school student and has focused on finding and creating opportunities to progress toward a career in bioengineering. Her next step will be an internship with BGE this summer. Jada Damond ’19, environmental engineering, will soon travel to Nicaragua to work on a water quality project. She is also particularly interested in alternative energy sources. 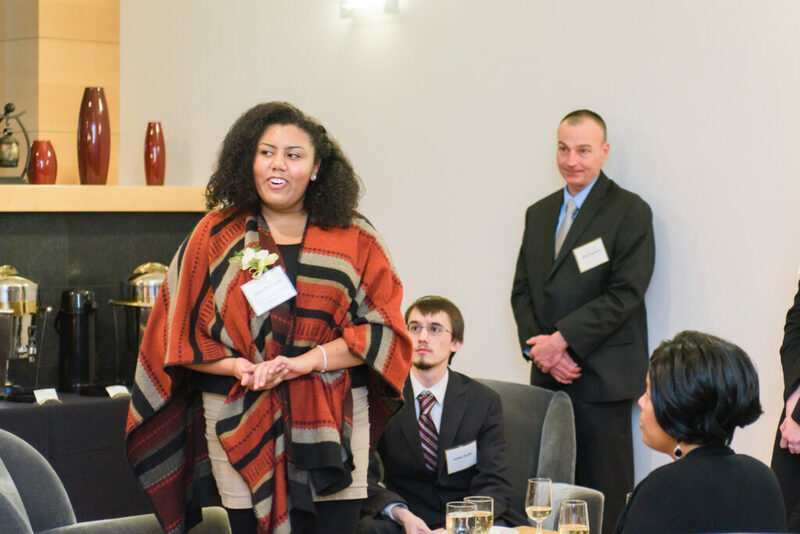 Jada Damond ’19 introduces herself to her fellow Hill-Lopes Scholars and the other reception attendees. Johanna Tsang ‘18, mechanical engineering, will intern at Northrop Grumman this summer in the Calibration and Quality Engineering division. Blair Landon ’19, chemical engineering, plans to pursue graduate school in biochemical or biomedical engineering and, at UMBC, she is already a learning assistant for general chemistry. Blair Landon ’19 (left) introduces herself to Ancelmo Lopes. Faculty mentors Jennie Leach, chemical engineering; Anne Spence, mechanical engineering; Elsa Garcin, chemistry and biochemistry; and Anindya Roy, mathematics and statistics, will play a key role in the program. “Being smart is not enough” to achieve success, UMBC President Freeman Hrabowski reflected. “There needs to be someone to say, ‘Give this person a chance.’” He described how faculty in the program will not only mentor the students, but also advocate for them. Stormy Hill ’17 meets Barbara Hill and Ancelmo Lopes. Photo Marlayna Demond ’11. In describing the power of mentorship, Pres. Hrabowski cited the success of UMBC’s ADVANCE program, which works to increase the number of women faculty at UMBC, particularly in STEM areas. 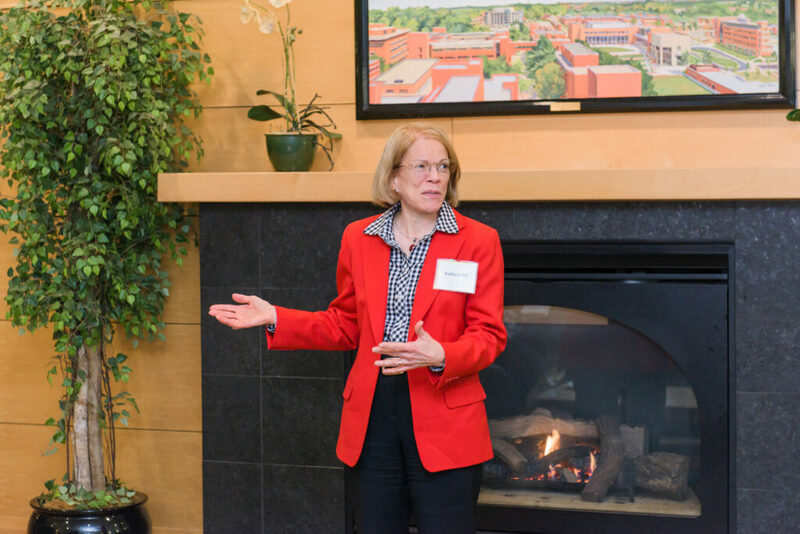 Since that program’s inception in 2003, the number of female tenure-track faculty at UMBC has increased 73.3% – a boost in representation beneficial for UMBC’s new Hill-Lopes Scholars. 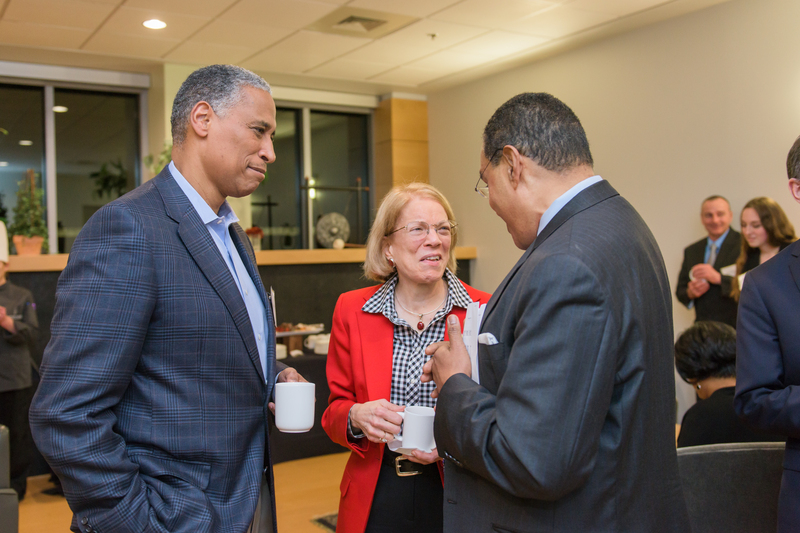 Ancelmo Lopes, Barbara Hill, and President Freeman Hrabowski converse at the Hill-Lopes Scholars reception. Banner image: The inaugural Hill-Lopes Scholars with Barbara Hill (far right) and Ancelmo Lopes (far left). Students from left to right: Stormy Hill ’17, Heather Frank ’17, Karla Negrete ’19, Jada Damond ’19, Blair Landon ’19. All photos by Marlayna Demond ’11 for UMBC.